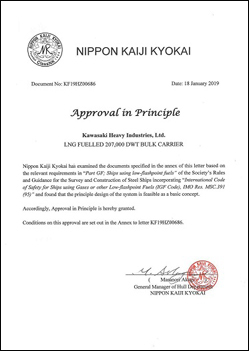 Kawasaki Heavy Industries, Ltd. announced today that development of a design for a 200,000 deadweight tons (“DWT”) bulk carrier powered by liquefied natural gas (LNG) had been completed, and that the design had received an Approval in Principle (AiP) from the Nippon Kaiji Kyokai (“ClassNK”) based on the classification society’s Rule Part GF, which adopts the IGF Code*. 1) By configuring the LNG fuel tank behind the accommodation in the stern, the ship keeps its cargo space as large as that of conventional oil-fueled ships. 2) Powered by low-speed, dual-fuel diesel engine, the ship achieves significantly reduced emissions of carbon dioxide (CO2), nitrogen oxides (NOx), sulfur oxides (SOx), and particulate matter (PM) when using LNG as fuel, meeting the EEDI** Phase 3 requirements. ** Energy Efficiency Design Index (EEDI). An amendment to Annex VI of the International Convention for the Prevention of Pollution from Ships (“MARPOL,” one of the IMO treaties), became effective from January 2013, requires new ships to meet energy-efficiency levels based on the EEDI, an indicator of the amount of CO2 (in grams) emitted per metric ton of freight and per nautical mile of transportation. The energy efficiency requirement is tightened incrementally from Phase 0 to Phase 3, with the baseline being determined by the dates that the ship was contracted and/or delivered. 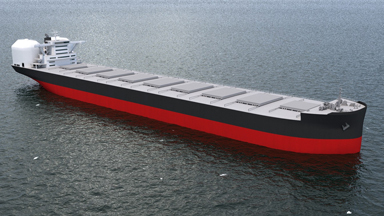 By Phase 3, bulk carriers larger than 10,000 DWT are required to achieve a 30% reduction in CO2 emissions.